Minimum Wire Diameter: .035" Maximum Wire Diameter: .120" Wire Feed: 12 1/2" Maximum Length of Longest End: 9" Maximum Length of Shortest End: 5 1/2" Maximum Number of Turns of Coiling Spindle: .035" to .080" Wire 68 Turns .080" to .120" Wire 44 Turns Maximum Spindle Travel 8 1/2" Largest Diameter of Spring (Varying with size of wire & longest end) 2" O.D. Production: 8 - 40 Springs Per Minute 5 H.P. 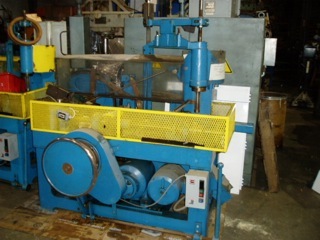 Varispeed Drive Height of Wire Line Above Floor: 33 1/2" Floor Space: 7' x 4' Weight: 3220 lbs.